Are you managing several cybersecurity projects at the same time? Do you feel that you could manage your projects more effectively, but don’t know where to start? 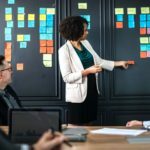 *Disclaimer: In this article, we focus on some of the most commonly-cited tips for effective project management within the cybersecurity context. This list is not meant to be exhaustive but is intended for guidance only. Managing a cybersecurity project without executive buy-in is like building a house without the signoff of the homeowner… risky. Make sure that your executive team is fully briefed about your projects and understands how they will help support overall business goals and manage your risks. Your executives will be particularly interested in your current cybersecurity posture and in how your projects will improve your posture sustainably and effectively. With executive buy-in, you will be more likely to get the budget you need and build the necessary trust to continue them going forward. A successful cybersecurity project is aligned to the overall business strategy and goals. Will it protect your most critical assets? Will it strengthen your overall security posture? Will it decrease your exposure to cyberthreats? Will it help you manage your risks more effectively? Will it bring measurable return on investment (ROI)? Will it focus on security controls that make sense for your business context? The closer your cybersecurity projects are aligned with your overarching business strategy, the more successful they will be. A cybersecurity project is more likely to succeed if it has clearly-defined SMART goals. SMART goals need to be specific, measurable, achievable, relevant and timebound. Specific: Your goal is defined as much as possible (who? what? where? why?). Measurable: You can track the progress of the project and measure its outcome. (how?). Achievable: Your project is reasonable enough to be completed within the specific timeframe and with the available means (personnel, budget, equipment). Relevant: Your project is worthwhile executing and will help you get closer to your goals and address your challenges. Timebound: Your project has a clear start and end date, as well as milestones to monitor performance along the way (when?). A cybersecurity project is just as good as the project management team behind it. Once your cybersecurity project is completed, you will need to demonstrate its return on investment (ROI). Now is the time to revisit your SMART goals that you established at the beginning of your project and evaluate whether you were able to meet your goals or not. 30% of all projects fail due to poor communication. Who do you to communicate to? When do you need to communicate? Where do you need to communicate? Regular and centralized communications will help you manage your cybersecurity projects more effectively. Katharina Gerberding is the Marketing Manager, Content Strategy at Hitachi Systems Security in Montreal, Quebec, Canada. In her current role, she is responsible for developing impactful content marketing strategies to strengthen the organization’s brand recognition, support sales efforts, and help raise awareness for cybersecurity across the globe. Katharina graduated with a Master’s degree in Cross-Cultural Communication and Business Management from Newcastle University, U.K., and obtained a dual Bachelor’s degree in Multilingual Communication and Linguistics from Cologne University of Applied Sciences, Germany, and Northumbria University, U.K. Since 2012, she is member of the sponsorship committee of the humanitarian mission “Sainte-Justine at the Heart of the World”, which facilitates knowledge exchange in pediatric cardiology for children around the world. Katharina is passionate about communications, cross-culturalism and holistic living, and can be found exploring the many restaurants of Montreal in her free time.